The Non-Commercial Sustaining Announcement (NCSA) program begins after discussions with Governor James Blanchard. The program was to help the MAB bring in more money so the association could go full-time. The endeavor worked, thanks to station participation, and about six-months after it first ran, Karole White was hired. 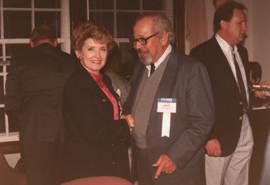 November 25, 1985: MAB officially moves from a part-time organization under the direction of Tom Cleary to a full-time organization under newly-hired executive director Karole L. White (photo right, circa 1985). White was recently with the Michigan Florist Association. The first order of business for the new executive director was to meet broadcasters across Michigan during a scheduled ten-location tour. Cleary’s lobbying firm, Michigan Legislative Consultants, remained as legislative consulting firm for the association. Beer and Wine Advertising, Tall Structure-Strobe Lighting and Seat Belt Laws are key issues facing Michigan broadcasters. 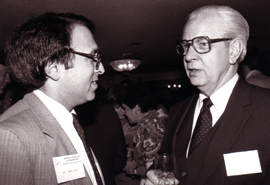 MAB holds its first-ever Regional Sales Seminars in 1986 with Richard Kaufman. More than 205 MAB members attended representing 55 different radio stations. Cost to attend was $35 per person. The MAB also held Broadcast News Workshops. 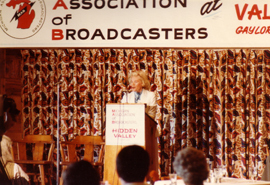 The first-ever MAB Awards for Creative Excellence (later to be named the Broadcast Excellence Awards) was held. MAB was granted approval to test a shortened Emergency Broadcast System (EBS) signal. Carl E. Lee, Fetzer Broadcasting Service and MAB President 1956, honored by the MAB for 50 years in broadcasting. The official logo of the MAB was introduced in March 1986. The first Member Needs Survey is administered in March 1986. Mid-Winter Conference (later to be named the Great Lakes Broadcasting Conference & Expo) moves to downtown Lansing in 1986. December 6, 1988: the building located at 819 N. Washington Avenue, Lansing, housing the MAB offices, is officially dedicated. The dedication ceremony and media uplink featured Governor James Blanchard, Senator John Engler, Representative Pat Gagliardi and FCC Commissioner James H. Quello along with approximately 290 guests. As a memento from the event, commemorate marble trivets embossed with an image of the new building were distributed. MAB Presidents during the 1980s: Edwin R. Huse, WKHM/WJOX, Jackson (79-80); Robert J. McBride, WJBK, Detroit (80-81); Joe D. Buys, WVIC, Lansing (81-82); Todd Holmes, WNEM, Saginaw (82-83); Ross Biederman, WTCM, Traverse City (82-83); Jeanne Findlater, WXYZ, Detroit (83-84); Eugene Umlor, WPHM, Port Huron (84-85); Bill Robbins, WKZO, Kalamazoo (85); Richard Sommerville,* WCEN, Mt. Pleasant (86); James P. White, WOOD, Grand Rapids (86-87); Guy Spitsberg,* WLUC, Marquette (87-88) (partial term); Jerry Colvin,* WUHQ, Battle Creek (87-88) (partial term); Charles D. Mefford,* MW Multicom (88-89). 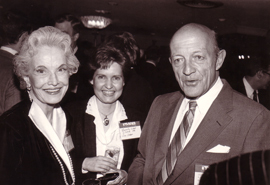 (l-r) Senator Carol Levin, Congressman Sander Levin and Dan Alpert, Detroit Public Television, during a Congressional dinner in Washington, DC in 1987. 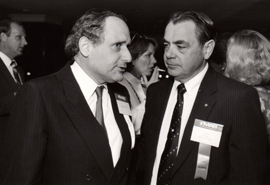 (l-r) Jerry Colvin, WUHQ, (MAB President 1988), greets special speaker Donald Canham, former U of M Athletic Director, during the 1988 Congressional Dinner in Washington, DC. Dr. Bette J. Erwin, Libertarian Candidate, addresses MAB attendees during the 1982 Summer Conference at Hill Valley Resort in Gaylord. 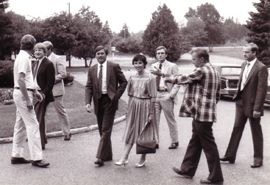 Tom Cleary (in the plaid jacket) directs Michigan Governor James J. Blanchard and guests to a reception at the Governor’s residence (circa early 1980s). 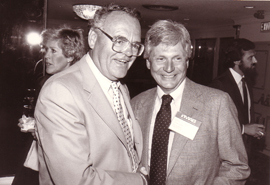 (l-r) Ken MacDonald, Sr., WSAM/WKCQ (MAB President 1975) and David Hicks, WKFR/WKMI, during the 1987 Congressional Dinner. 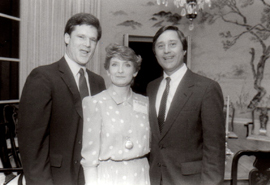 (l-r) Steve Marks, WBKB-TV; Nancy Waters, WCXT-FM; Barbara Levin and Carl Levin during the 1988 Congressional Dinner. 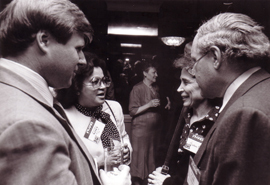 (l-r) Mary Quello; Beverly West, WAAM-AM; and George Williams, WKBD-TV, during the 1987 Congressional Dinner. 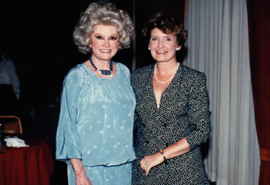 Comedienne Phyllis Diller highlighted the 41st MAB Annual Conference at Shanty Creek/Schuss Mountain on August 4, 1989. Pictured here with Karole White. 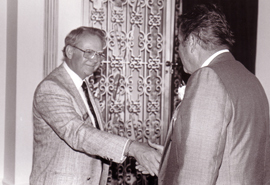 Representative Howard Wolpe and Gordon Anderson, WKZO-AM during a 1983 reception. 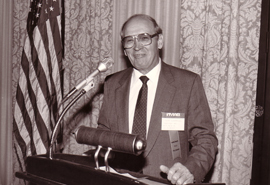 Richard Sommerville, WCEN, (MAB President 1986) during a 1987 Congressional Dinner in Washington, DC. 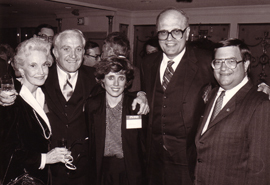 During the 1987 Congressional Dinner in Washington DC, (l-r) Mary Quello; Commissioner James H. Quello; Debbie Dingell; Congressman John Dingell; and Eddie Fritts, NAB. 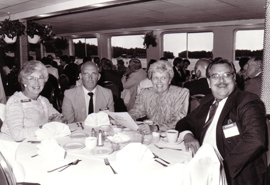 Members aboard the “Spririt of Charlevoix” during the 1988 Annual Conference. 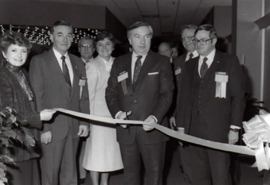 The official Mid-Winter Conference (now GLBC) ribbon cutting as it moved to downtown Lansing in 1986. 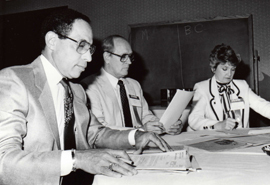 (l-r) Bill Robbins, WKZO (MAB President 1985); Karole White, MAB; Governor James Blanchard (circa 1985). 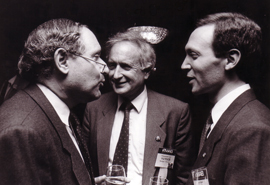 (right) Gene Umlor, WPHM (MAB President 1985) talks with Senator Carl Levin during a Congressional Dinner (circa 1987). 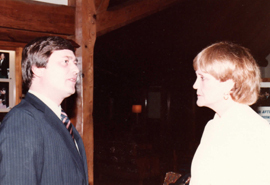 (l-r) Governor James Blanchard and Jeanne Findlater, WXYZ (MAB President 1984). 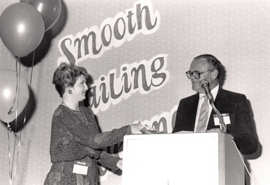 Karole White and Ken MacDonald, Sr., WSAM/WKCQ (MAB President 1975) during the “Smooth Sailing” themed Summer Conference in 1987. (l-r) Karole White, MAB, and Tony Gaston, WKZO (MAB President 1976) during the new MAB building dedication in December, 1988. 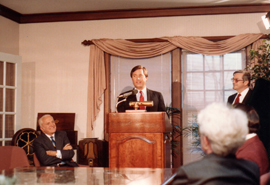 Governor James Blanchard speaks during the new MAB building dedication ceremony on December 6, 1988. At an MAB Board Meeting (l-r) are Thomas Fox, WJBK and MAB Secretary Treasurer 1986; Richard Sommerville, WCEN (MAB President 1986) and Karole White, MAB (circa 1986). 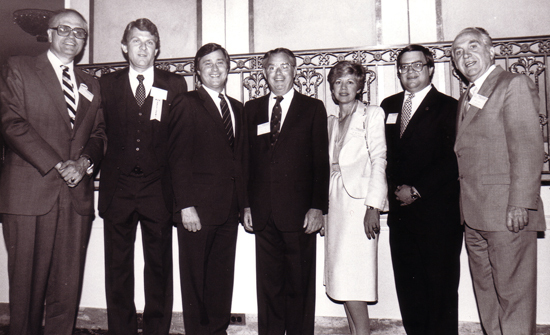 (l-r) Congressman John Dingell, Ross Biederman (MAB President 1983); Governor James J. Blanchard; Peter A. Kizer (MAB President 1984); Martha Dale Fritts; Eddie Fritts, NAB; and FCC Commissioner James H. Quello in Washington, DC. It was a different world in 1983. Imagine not using the internet or a cell phone. We held our annual Summer meeting…a three-day affair…at Hidden Valley in Gaylord, a resort that didn’t have phones in the rooms! The most reliable phone service was the pay phone in the lobby. And, believe it or not, there usually wasn’t a line of people waiting for it. To add insult to injury, some rooms came equipped WITHOUT radios or TV sets. This, as many of you will recall, was before consolidation. Everyone pretty much knew everyone else. Most attendees were owner-operators. And the “corporate types” were mainly from the Detroit market. We had a membership problem in the early and mid 80s. During my tenure, the MAB added over 30 member stations as a result of a membership drive that was the main focus of my year as President. The association had a part-time director, Tom Cleary. Tom also ran the Michigan Milk Producers lobbying office part-time. These were the not the “good old days.” It was just much different. Ross Biederman’s comments originally appeared in the April, 2009 issue of the MAB E-Newsletter. by Tom Bryson, WJRT-TV (Flint) and MAB Past President, 1990. The best thing I did after arriving at WJRT-TV in Flint in 1985 was to become active with the Michigan Association of Broadcasters. It was in the tiny two-room rented offices of the MAB when Tom Cleary, our then part-time MAB manager, suggested we recruit a full-time Executive Director. We found Karole White, who has led us to incredible accomplishments, including the establishment of a reputation as among the most effective broadcast associations in the US. On my office wall is a picture of MAB’s new, and now permanent headquarters. I recall standing in the conference room in 1988 when Governor Blanchard, then State Senator John Engler and our beloved former FCC Commissioner and distinguished Michigan broadcaster James Quello as we dedicated this new milestone headquarters. We owe some much to those who came before us, including Ken MacDonald, Les Biederman and others who left us in the decade of the eighties. If you had the chance to visit the MAB Broadcast History Exhibit, you would have seen whose shoulders we stand on. But the future is in good hands and there is no better band of men and women than those who comprise the MAB to lead us confidently into the future, whatever it may bring. Tom Bryson’s comments originally appeared in the April, 2009 issue of the MAB E-Newsletter. certain non-broadcast equipment) and planning the annual meeting. 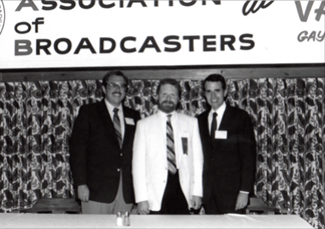 (l-r) Bob Liggett, Liggett Broadcasting; Dan Stewart, WHNN-FM; and Gary Stevens, WKNR-AM during the 1984 MAB Annual Conference. We moved the traditional conference date from September to August. (That was good, for one time.) ABC, which owned WXYZ-TV, agreed to pay for their Presidents of Broadcast Standards and Research (among other presenters) to give seminars in their professional areas. Larry King was our headliner. Either the earlier date or the program offerings drew a large attendance. We all knew the MAB could not grow unless we could generate income beyond dues. At the time, Governor James Blanchard was engaged in an intense effort to promote Michigan and its economy. Doug Ross, the State’s Director of Commerce brought an idea to me that I found exciting and Tom said was a model in other states. So, at our last session in Gaylord, I presented it to the MAB membership. It fell flat. But it didn’t die. Too good not to use, the idea was refined by Tom, Doug Ross, the Governor’s Press Secretary Rick Cole, State Treasurer Robert Bowman and MAB past presidents Ken MacDonald and Peter Kizer. Simply put, member stations would each air beautiful promos about the State 15 times a month. The spots would be treated as PSAs, and the State would compensate the MAB for its participation. With a lot of work, Ken and the Board sold it to the members. Once implemented, our income increased five fold and a new era was launched. A year later, the outstanding Karole White was hired as our first, full time executive director and the MAB grew quickly from a part-time volunteer association to the sophisticated nationally recognized business organization it is today with superior professional programs, an array of member services, a polished website and a magazine. I am fortunate to be part of MAB’s history; even more to be a member of its illustrious present. 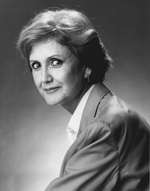 Jean Findlater’s comments originally appeared in the April, 2009 issue of the MAB E-Newsletter. Download a transcript of this interview here.